Avoid detangling duty next year. It’s easy to get complacent when tearing down your holiday decorations—all you want is to toss them in a closet and forget about them for 12 months. But if you do a haphazard job in January, you’ll be greeted with a tangled mess of lights and ornaments when December rolls back around. Don’t turn next year’s Christmas into a chore. Here’s how to pack your decorations this year so you can ease your future self’s life. If you have trouble remembering how to set up your decorations every year, then snap a few photos before you begin tearing them down. That way, you can print out these images and put them in the boxes with your decorations. For example, I often forget which lights go where, and exactly how I hung them. A few pictures help jog my memory and speed up each year’s setup. Next, grab a label maker—or some sharpies and masking tape—and mark every box with its contents as you pack it. This sounds obvious in retrospect, but I spent years digging through 10 boxes of unrelated junk trying to find the Christmas decorations. Never again—a few simple labels save me all that trouble. String lights are easily the most annoying decoration to store. Every year, I wrap them neatly in a loop, place them gently in a box—and somehow still end up untangling a rats nest of tiny lights when I go to decorate. In my experience, there’s no way to 100 percent avoid this—those little lights are like fish hooks, and they’ll always catch on something. 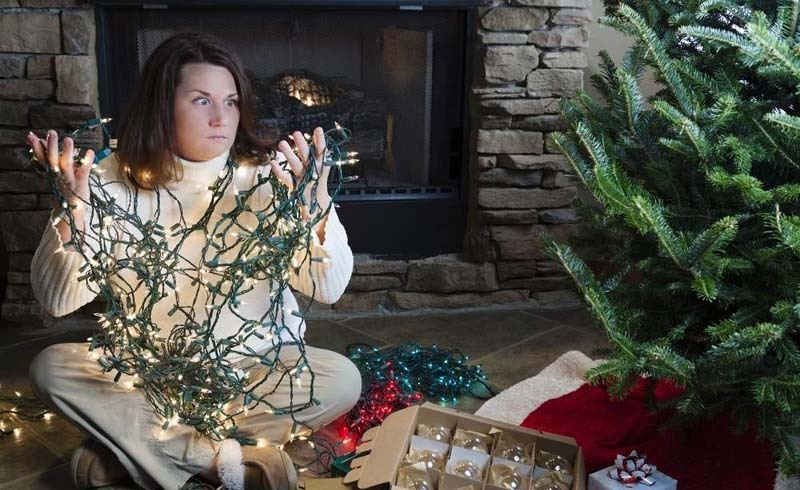 You can, however, alleviate the problem by wrapping your lights around something to avoid tangles. Old coffee cans work best, but these can be tough to store. The cardboard tubes left over from your gift wrap are a great alternative. If you want something that lays more flat, use a few old pieces of cardboard—just be careful not to kink the wires too much as you wrap them around the edges. When you opt for this method, you gain an added bonus: You can label each piece of cardboard based on where those lights go in your house. For a long time, my family just tossed our ornaments in a plastic bin with a bit of tissue paper and called it a day. This can cause fragile ornaments to break if jostled too much. Or, even if they don’t break, they can still rub against each other, tangling their hooks or wearing down the paint on their sides. There are better ways to pack these keepsakes. I’ve seen people recommend egg cartons, gluing paper cups to a bin, and lots of other craft-y solutions—but honestly, it’s way easier to just buy an inexpensive box designed for ornament storage. You’ll get more space, and you won’t have to waste time digging for trash to build your own solution. This plastic bin from Snapware only costs $20, and you can find plenty of fabric boxes priced a bit less expensively. Alternatively, if you’re determined to avoid spending more money, you could just make your own dividers out of old cardboard boxes. However, you may have to remove a few of the cardboard dividers to make room for your larger ornaments. If you have an artificial Christmas tree, you want to make sure you reuse it as many years as possible—not just for your wallet’s sake, but for the environment’s as well. So the less you scrunch the tree up and wear out its branches, the better. 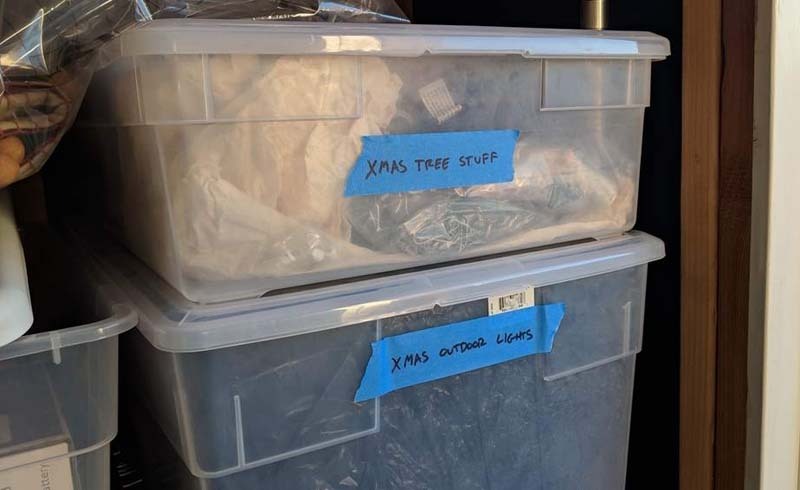 Instead of stuffing your tree back in its original box, which is probably a tight squeeze, grab a tree storage bag like this one. It has straps to tuck in your tree without squeezing it too tight, and it will keep your counterfeit conifer safe from water, dust, and pests. If the price is a bit steep, this bag is a bit less impressive, but much cheaper. Artificial wreaths require similar care. A hard-shell case will ensure it never gets crushed by your other boxes. A real tree presents fewer storage challenges, since you’re probably going to get rid of it completely. Just make sure you do so in an environmentally-friendly manner. Rather than spending time on storage, you can use those minutes for tree cleanup. For example, if it left sap on your carpet, just blot the goo with a rag soaked in rubbing alcohol. I’ve also found a dust buster cleans up pine needles much better than a traditional vacuum, as the mess clogs its brushes far too easily. Spend some time on cleanup this year to avoid stress next winter.